So the cobra equation has made me re-evaluate the dynamics of the effective demand limit. The main reason is that the graph of the Cobra equation shows that capital utilization decreases as employment increases at the effective demand limit. I was assuming that as employment increased, the utilization of capital would also increase. That was an error. 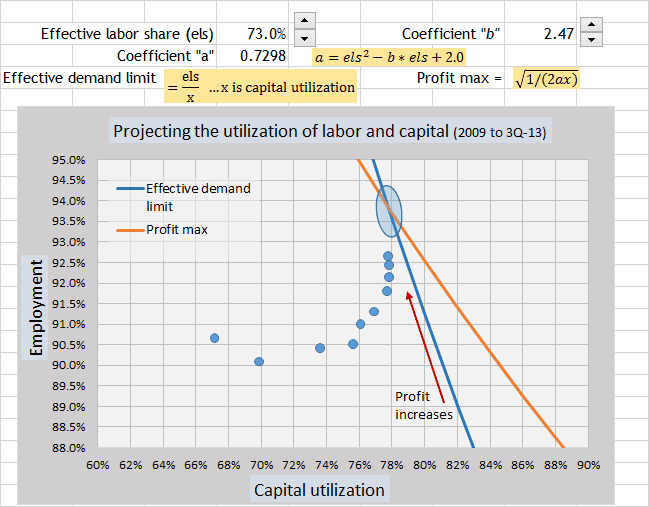 As businesses in the aggregate reach for profits, the path at the effective demand limit shows that capital will be less utilized as labor is more utilized. I had been thinking that unemployment would bottom out at 6.7% to 7.0%. That was assuming that capital utilization would increase. But now I see that unemployment can go lower, because capital utilization will not increase. Equations for the two lines are given above the graph. The blue oval shows the projected range of the equilibrium point where profit maximization crosses the effective demand limit. The economy gravitates toward that blue oval area. The utilization of labor and capital (blue circles) is moving along the effective demand limit following increasing profits toward the blue oval. The Cobra equation is the equation that I have been searching for since last year. Now that I can see it, the dynamics of profit at the effective demand limit are coming clear. I still see the environment for a recession starting in one year, but the dynamics of that environment are clearer. For reference… here is the Cobra equation to measure the profitability of utilizing labor and capital dependent upon labor share. a = coefficient for labor share to establish profit maximization. Coefficient “a” = (els)2 – 2.474*(els) + 2.0 … (els = effective labor share, for example 80% as 0.80). People sometimes assume that when firms act in their best interest it will also maximize GDP. Certainly the Fed is looking at GDP growth. What does the GDP surface look like and what route gets followed as firms follow a profit optimizing path? That is a very good question. And a very good point. Firms are not trying to maximize GDP. They are trying to maximize profits. And if that means cutting GDP growth down a bit, they will do it. But you bring up a different approach by incorporating wanting to graph GDP as profits are optimized. 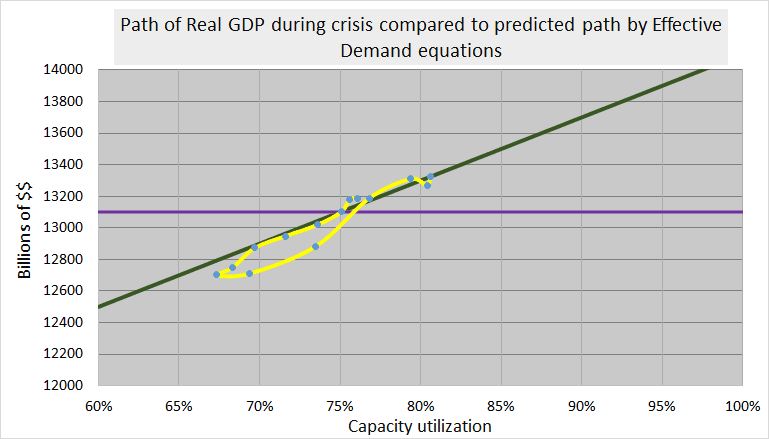 It shows that real GDP fell as the effective demand equation would have predicted as capacity utilization fell. Now in that graph, potential GDP as determined by effective demand did not move for 3 years. That is what allowed real GDP to track nicely with the equation. Yet, lining up profits and GDP will be difficult. GDP is not limited to a range of percentages. It is like the smoke that rises from a campfire. It’s not part of the fire and wood that produces the smoke. One of the disadvantages of capitalism is the drive to maximize profits rather than maximize employment. We sacrifice people for money.